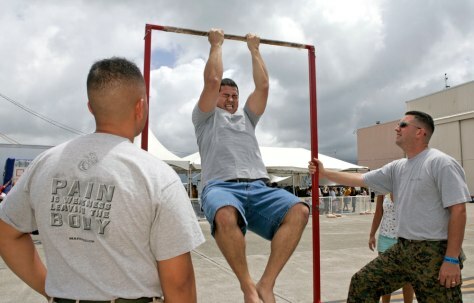 Matt Elam, center, competes in a pull-up contest while Marine recruiters Sgt. Marco Hartanto, left, and Gysgt. Brian Lancioni look on at Marine Corps Base Hawaii on July 4 in Kaneohe, Hawaii.